The chairs are made out of fine walnut wood. 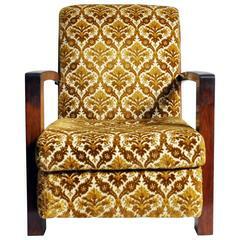 Upholstered with light velvety fabric. The back of the chair has back support for a greater comfort. Bigger part of handlebars are covered with fabric. 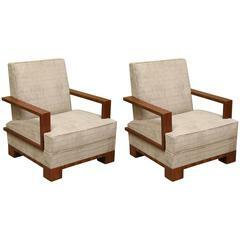 Hungary, circa 1930s Measures: 28” W x 33’ D x 32” H.
Pair of Art Deco armchairs. Walnut structure.